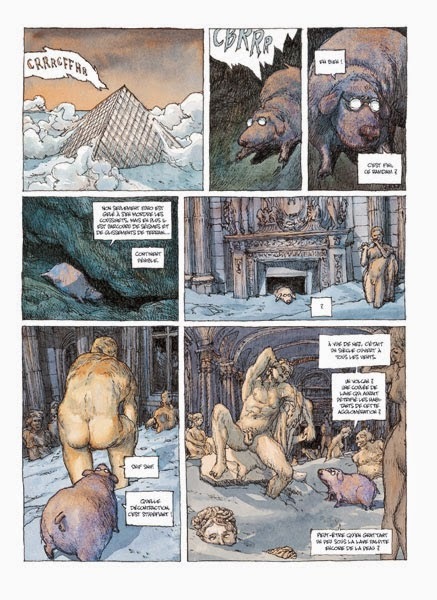 NBM's had some success in publishing the translated versions of comics originally published by France's Futuropolis inspired by the famous Louvre. 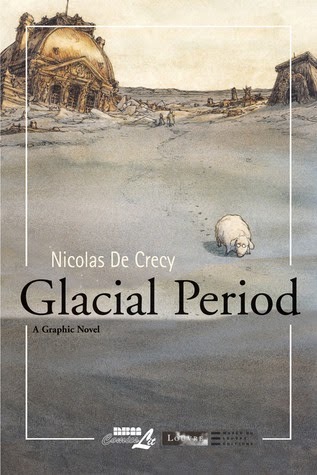 The series has been so successful that NBM just reprinted Nicolas De Crecy's Glacial Period, the book that kicked off the series. NBM is notorious for reprinting European comics at a much smaller size than their original albums in order to save costs, but the reprint is pretty much identical to the original in terms of size. For a long time, not printing the original big album size made economic (though not aesthetic) sense, as Americans seemed to actively resist buying any kind of comics in this format. With the slow acceptance of European comics in American book stores and comics shops and a greater insistence on maintaining the fidelity of the original comics (and a willingness to pay for such fidelity), NBM is now showing a greater willingness to take risks and publish comics in such a way that properly flatters the art of their creators. In the Louvre series, this has been especially important, since most of the books have been light on narrative and heavy on Louvre-inspired imagery. One of the oldest and greatest art museums in the world, the sheer variety of works in the Louvre means that no two artists would react to its holdings in the same way, even in a museum with a number of pieces so famous that even laymen are familiar with them, like Da Vinci's Mona Lisa. De Crecy was interested in the concept of interpretation and wove a funny tale around an old story concept: what would archaeologists from the future make of objects from our society from today without any kind of hermeneutic context? In this case, in a future world where climate change has induced the titular Glacial Period, a group of explorer-archaeologists manages to find the Louvre, buried under ice and snow. Like the proverbial blind men examining an elephant, each explorer's background and biases makes the Louvre seem like something different. In one remarkable sequence, one explorer sequences paintings to create a "history" of an island nation that was a city of vice and carnal pleasure, whose economy was based on water, and that fell in a torrent of fire and monsters rising from the sea. This is one of many silly interpretations that is only brought to bear after De Crecy carefully spends time establishing his characters. There's the grizzled veteran who's a misogynist, the idealistic archaeologist, the clever daughter of an explorer who now functions as his legs, and the genetically altered dog that proves to be the most important character in the book. Named Hulk (after one of the "old gods"), this talking and intelligent creature is part pig, giving it a nose that can actually discern the ages of the objects it smells. When the artwork of the Louvre starts talking to him (including a score of Jesus Christs in one of the book's best jokes) and tells him what the Louvre actually is and how it's in danger of falling into a crevasse, Hulk saves the day by getting them to combine into the shape of a dog and run out. It's a ridiculous ending to what is really a silly book, one that lampoons scientific hubris with lines like "What beings are naive enough to express themselves through drawings?" What distinguishes it is De Crecy's wonderfully scribbly, fragile line and the beautiful watercolors that have almost a burnt quality. De Crecy also does a fine job balancing images from the Louvre with an actual story. 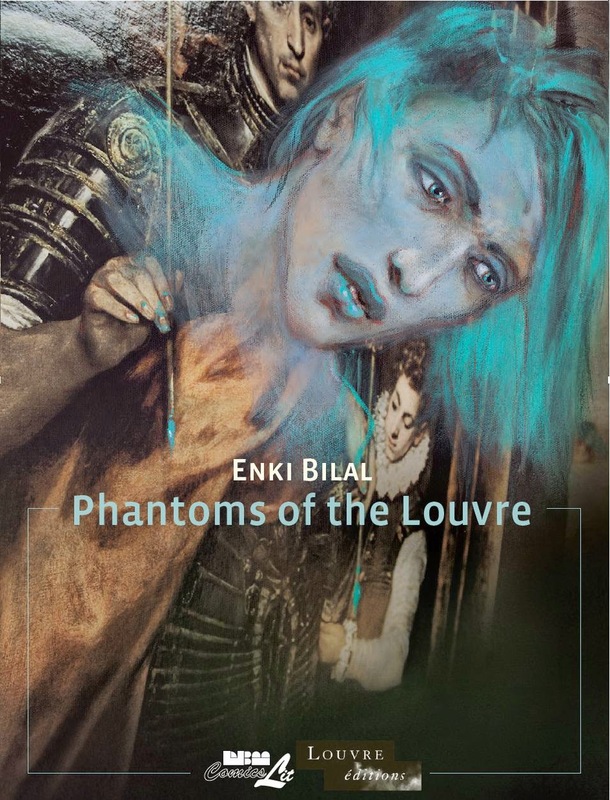 The same can't be said for Enki Bilal, the well-regarded fantasy and science fiction cartoonist, in his Phantoms of the Louvre. Those expecting a mind-blowing series of Louvre-inspired drawings will be bitterly disappointed. Instead, Bilal spent most of this project looking inward, imagining the phantoms and/or muses that might have inspired or played a part in the creation of each work of art. He then spins a biography of each of these figures' life from cradle (including birth weight) to grave, creating a frequently rich imaginary history. It's not an accident that he hits on famous works like the Mona Lisa and Hammurabbi's Code, because it's fun and tempting to come up with historical fiction surrounding these works. The same is true for the famous Christ Dead, as he comes up with a detailed backstory for Longinus, the guard who pierced Christ's side with a spear. It was actually more interesting to see Bilal conjure up the lives for other works, imagining Frans Snyder's Fish Market and seeing a boy who was born in a fish market and became a daring sailor. Bilal also imagined Lakshem, attached to the piece Human Headed Wood Bull, as an ancient man who had a special rapport with bulls. Analia Avellaneda was a color savant who was an assistant to El Greco, before her involvement in a romance led to her being poisoned. To be clear, this book does not contain anything resembling comics. 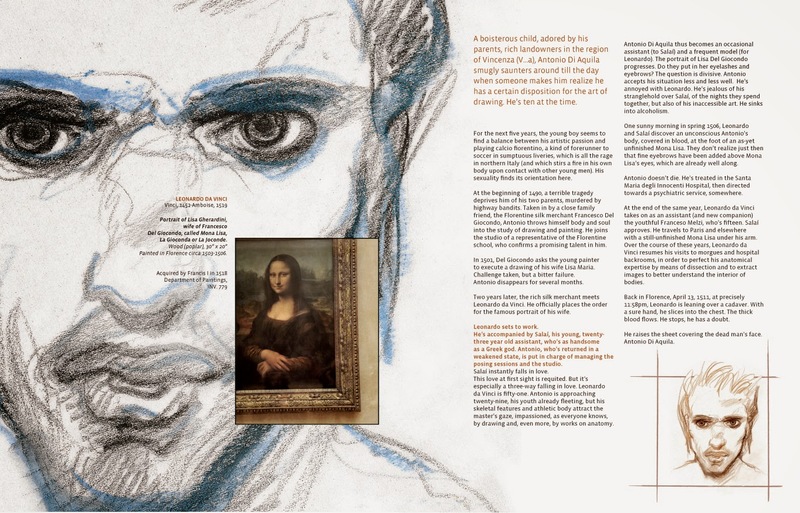 Instead, there's a big image of the original work of art overlaid with a "phantom" drawing by Bilal. That's then explicated by a small image of the original piece, Bilal's extended text regarding the phantom's history, and then a small reproduction of his original drawing. Those drawings are pretty rough and sketchy, and the result seems overblown and overproduced. I would have loved to have seen Bilal pick maybe five or six of these phantoms and actually draw a story instead of the padded, tedious and undercooked package that we saw here. Indeed, the novelty of the book quickly wore off after the first couple of phantoms, and Bilal even started repeating himself in terms of ideas, as several of the phantoms were killed by jealous lovers. Several had ancient, mystic qualities. Bilal spent a lot of time thinking about the phantoms but didn't seem to want to spend very much time actually doing what he's best known for (drawing), which is certainly unfortunate for those who might shell out for this book hoping to see his virtuosity on display.